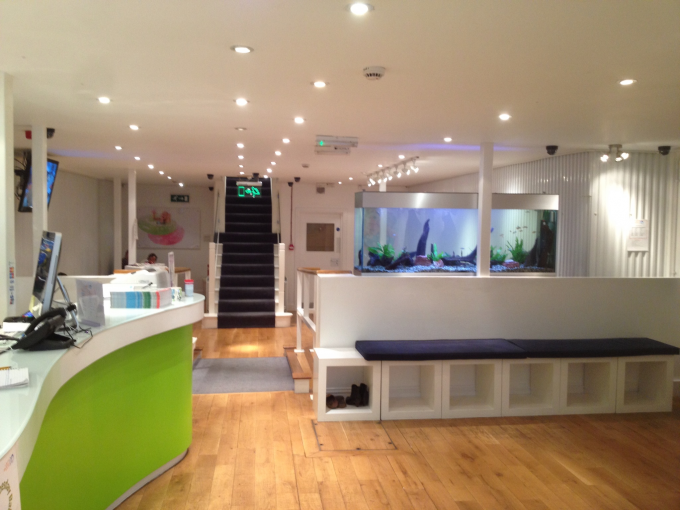 This swimming school aquarium is in the reception area of a swimming school in West London. It is planted with aquatic plants with a combination of mango wood and tiger rock. The fish include rainbow fish, angels, platies and barbs which are all tropical. The plants are aided by a co2 system as well as by strong lighting which allows them to flourish. So much so that we normally have to trim them back during aquarium service visits. In spite of its length the aquarium is still in 12mm glass as it is just 75cm in height.